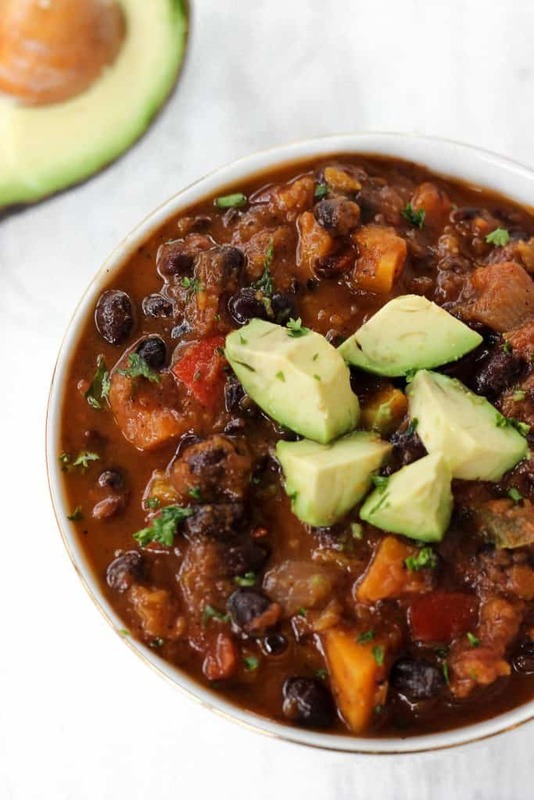 Thick & hearty vegetarian butternut squash black bean chili– the perfect thing for a cold winter day! One of my absolute favorite meals is a big bowl of homemade soup or veggie chili. It’s so easy to make, especially if it’s vegetarian so you don’t have to worry about cooking meat, inexpensive, and cozy. I always find myself craving homemade soup or chili on cold, windy days like today. Winter in the south has been extra up-and-down this year. Today’s 40 degrees with 20 mph winds, but yesterday was 70 degrees and sunny. Give us a few weeks and we’ll probably see some more snow. Totally happy about that, though– I love snow days. Playing outside, snuggling up to watch movies, (okay, maybe also watching the lectures any of my tech-savvy professors figure out how to post online when class gets canceled), and taking time to make something warm and comforting like this butternut squash black bean chili? Sounds like an almost perfect day to me. I adapted my favorite black bean, lentil, & sweet potato vegetarian chili recipe to make this butternut squash black bean chili. When I’m looking for shortcuts, I buy pre-chopped butternut squash ($4 for 2 pounds at Harris Teeter!) and then this butternut squash black bean chili is even quicker to make than its lentil/sweet potato older sibling. 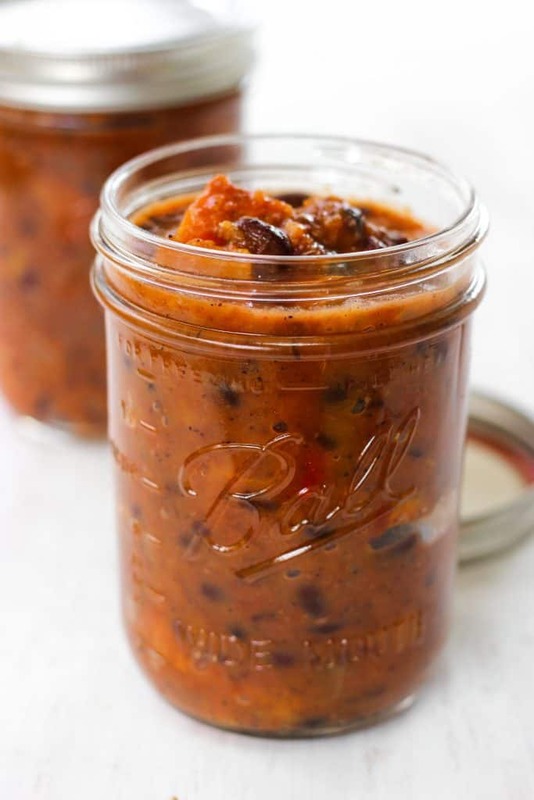 I made this butternut squash black bean chili once when I was at home a few weeks ago and shared some with my parents, who gave it two thumbs up, and then I froze the rest in mason jars for later. This makes a big batch, so you could definitely halve the recipe or make the full recipe and plan to freeze the leftovers. Or do what I often do and invite some friends over to your dorm room/apartment/house for dinner! When I’m not having people over for dinner, I love freezing leftover soup or chili in individual portions in mason jars for my dorm freezer. All I have to do is move the jar from the freezer to the fridge at night sometime before I go to bed, and then it’s defrosted by dinnertime the next day. And chili freezes so well! It’s still delicious and perfectly thick after being frozen, defrosted, and reheated. Speaking of which, this particular chili is so thick and I love it. I often end up increasing the amount of veggies or decreasing the amount of broth called for in other chili or soup recipes, because extra hearty chili is my favorite. This butternut squash black bean chili has lots of flavor and is great even without toppings (or just a dollop of sour cream– my personal favorite), but if you like, you can add crushed tortilla chips, avocado, cheese, diced green onions, etc. Optional for topping: sour cream, cheese, avocado, crushed tortillas chips, etc. Heat olive oil on medium-low heat. Add chopped onion and bell pepper and stir. Immediately add chili powder, cumin, and cayenne pepper. Once onions and bell peppers have softened, add fire roasted tomatoes, broth/water, and butternut squash. Turn heat to high until broth comes to a boil. Once liquid has reached a boil, turn heat back to medium low and simmer for 20 minutes, until butternut squash is soft. Add black beans. Run a potato masher through the chili and roughly mash about half of the chili to thicken it up. Top with sour cream, cheese, avocado, crushed tortilla chips, and any of your other favorite chili toppings. Once when I didn't have onion or bell pepper, I skipped the sauté step and added the spices with the rest of the ingredients and it turned out well. You can substitute chopped sweet potato for the butternut squash and add 10-15 minutes to the total cooking time. Turn this into a slow-cooker recipe by cooking for 3-4 hours on high or 5-6 hours on low, depending on your slow-cooker's settings. A big bowl of hearty chili always hits the spot for winter days… I LOVE the possibilities of toppings and all the flavors blending together. Mhmm, he best thing for winter days! You have such good recipes on line. I appreciate them. Butternut squash and black beans are a great combo! Almost sweet and savory.